"I must kill the white man to avenge what he has done; the spirits of my people command me. I cannot live this life - I would rather die." Utu tells the story of Te Wheke (Anzac Wallace), a Maori Indian employed as a guide by a British regiment in New Zealand, during the British Colonial campaigns of the mid-1800s. After witnessing the massacre of his own village by his employers, Te Wheke vows to exact utu, or retribution, undergoing a ritual scarring ceremony and leading a growing number of followers against the British forces. The violence that ensues engulfs the lives of a British man named Williamson (Bruno Lawrence), whose homestead is besieged by Te Wheke's band of outlaws; Lieutenant Scott (Kelly Johnson), a white soldier born and raised in New Zealand who begins to doubt the wisdom of his leaders; Kura (Tania Bristowe), a Maori woman who loves her people's freedom as well as Lieutenant Scott; and Wiremu (Wi Kuki Kaa), a mercenary Maori employed by the British regiment, who sees hope for his people in the British values of education and civilization. Utu has been likened to an American Western, and it clearly borrows some of the genre's conventions of blood-and-thunder gunplay set against an epic backdrop. But Geoff Murphy's film garnered critical raves primarily for its evenhanded, unbiased approach to the subject matter—while it stands as an indictment of the arrogant British Colonial system, it does not condone Te Wheke's more violent actions. There are atrocities committed by both sides, and sympathetic figures on both sides as well; the film refuses to oversimplify the complexities of the situation. The film is based loosely on historical incidents, but all characters and events in the film are inventions of screenwriters Murphy and Keith Aberdein; still, the film feels genuine in spirit, and is probably more faithful to the truth of the matter than a heavily-researched but dramatically distorted story might have been. Utu also received critical recognition as a major film from the New Zealand movie industry at the time of its release, a novelty that has faded as Peter Jackson and his colleagues have become more widely known. This is not to say that the film's quality was in any way overrated—it's a finely composed, well-told story produced with a relatively lavish three million dollar budget. Costumes, sets and weaponry seem authentic and certainly believable, and the film never visibly falters on account of budget limitations. Performances (many by native Maori actors) are convincing and complex, suiting the film's own ambivalence about the events it depicts. 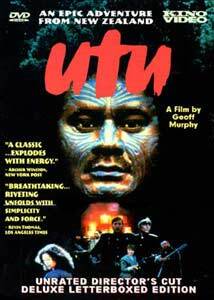 Kino's DVD presents the unrated 1988 Director's Cut of Utu, incorporating some fourteen minutes of footage cut for the 1983 US theatrical release. The DVD packaging implies that this version simply restores some bloody, violent footage, but the film's structure appears to have been changed as well, from a "flashback" approach to a more chronologically straightforward telling; I have not seen the 1983 version, but some of Kino's press materials imply that the earlier version was structured in a significantly different manner. In any case, this unrated version is certainly violent, but not grotesquely so. If Utu has a failing, it's that its painstakingly evenhanded approach deprives the audience of obvious villains and heroes; the visceral thrills of its well-executed battle sequences are muted by our sympathies for the injured, and the film's surprising ending evokes mixed feelings to say the least. But this is also Utu's greatest strength—it stirs the emotions, but not at the expense of intellect, and forces us to consider how we ourselves would behave in such a situation. Geoff Murphy's culturally-aware film leaves no room for simplistic morality; when there are no bad guys, there can be no good guys. The morally untenable position of the British is questioned but not destroyed, Te Wheke's own people suffer under his increasingly demagogic crusade, and the vengeful force of utu is all that remains when the smoke has cleared. Powerful, thought-provoking stuff. Image Transfer Review: Kino's Utu DVD presents the film in its original 1.66:1 widescreen aspect ratio with a non-anamorphic letterboxed image. The transfer appears to have been taken from a rehashed laserdisc master, drawn from a slightly dirty print; 3:2 film-to-video pulldown is apparent, color seems faded, and there's a lot of smeariness with middling detail in complex scenes. The two-hour-plus film is crammed onto a single-layer disc, leading to some I-frame "pulsing" and digital blocking artifacts here and there, and there's a general softness to the image throughout; not unwatchable, but well below contemporary DVD standards and Kino's usual level of quality. A remaster from film would have been vastly preferable. Audio Transfer Review: Utu features a Dolby Digital 2.0 monophonic soundtrack, ProLogic-decoded to the center speaker. Despite some hiss and faint crackle throughout, the film's well-designed soundtrack comes through with a strong presence that creates a convincing illusion of depth. Low-end bass is adequate when called upon, and frequency range is quite good (especially noticeable during the opening overture that plays over a black screen). The 1983 film's analog audio sounds a bit dated today, but the competent DVD transfer supports the film very well. Extras Review: Kino Video provides no supplemental material of any kind on the Utu disc, just 16 text-menu chapter stops and static menus featuring images from the film. All manner of supplements suggest themselves—some historical information on British Colonialism and its impact on the Maori, for example—but alas, the cupboard is bare. Utu is a fiction based on New Zealand's historical conflict between British Colonial forces and the native Maori Indians; it's a tale of morality, revenge and Western-style violence, enhanced by an even-handed script, solid production values and convincing performances. Kino's DVD unfortunately suffers from poor video quality and lack of supplements, though the audio is solid. If the subject matter appeals, it's worth a rental, but the DVD presentation leaves much to be desired.